JOIN Barb and John as they start the hour by discussing the release of the Mueller Report. Then continue listening as they discuss the rise of corruption and kleptocracy in America. Mueller’s done and the report is in, but now what? Although there will be no additional indictments from Mueller, what happens next? What does all of this mean for Trump? One thing is known, Mueller’s investigation revealed Russia’s extensive efforts to influence the 2016 election and multiple Trump associates lied about their contacts with Russian officials and others with ties to Moscow. And while Mueller’s investigation wraps up, investigations into Trump and his business and administration are not over. The House has announced multiple investigations and Mueller’s team has farmed out some of the cases to other prosecutors. Our founding fathers fears of kleptocracy and corruption were well documented. In 1785, Benjamin Franklin returned from Paris with a bejeweled gift, which incited immediate controversy. The Founders understood that such a gift could cloud the judgment of a public official and it represented the elevation of personal gain over allegiance to the public’s greater good. In 1787, James Madison mentioned corruption no less than 54 times in his notebook. For our country’s first 200 years, our justice system maintained the Founder’s vigilance against corruption, but no longer. Our current political, legal, banking, and even educational cultures have long since abandoned these ways. Citizens United stands as testament to the new legitimized political economy of shadows, and Mueller’s investigation exposed Paul Manafort’s work on behalf of Ukrainian kleptocrats, which was deeply tied to this country’s powerful elite. If our Republic and democracy are to endure, we must hold all of our officials accountable without exception. Those in positions of power, whether in the political and justice arena or educational system must understand that corruption undermines a credible democracy. Our Founding Fathers were rightly concerned that venality and corruption would become standard practice and, unfortunately, they have. 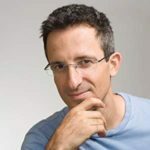 Joining the show in the second hour is New York Times bestselling author, lecturer, and serial entrepreneur, Dr. Tal Ben-Shahar, Ph.D. Dr. Ben-Shahar will be discussing his latest book, Short Cuts to Happiness: Life-Changing Lessons from My Barber. People around the world are more miserable than ever before. According to Gallup’s new 2018 Global Emotions Report, a survey of the emotional lives of more than 154,000 adults in over 145 countries, our daily experiences of worry, sadness, stress, anger, and pain have hit the highest levels since Gallup began measuring these data over a decade ago. Worse still, Americans’ negative experience scores are higher than the average across the globe. In an era of zero-sum politics, money and work anxieties, and a proclivity for grievances, Americans are losing their sense of gratitude and their can-do attitude for the positive impact they have on the world, says international happiness expert and renowned Harvard positive psychologist, Dr. Tal Ben-Shahar, Ph.D. Even in these trying times, explains Ben-Shahar, happiness isn’t a futile, unattainable quest. Shortcuts to happiness are all around us. In fact, Ben-Shahar found his in a barber’s chair. In Short Cuts to Happiness: Life-Changing Lessons from My Barber, New York Times–bestselling author Tal Ben-Shahar chronicles his conversations with Avi Peretz, his longtime barber, whose powerful insights spotlight how happiness can be found in surprising, everyday places: the smell of lilies, a good laugh, or a casual chat with a barber. Why relationships are the No. 1 predictor of happiness. Why being authentic—and true to ourselves—is when we are most content. Why curious people are healthier and live longer. Why positive, personal relationships breathe life into business. Why generosity contributes to ourselves, to others, to the world. Dr. Tal Ben-Shahar, Ph.D., taught the historically largest course at Harvard University, “Positive Psychology,” and the third largest, “The Psychology of Leadership,” attracting 1,400 students per semester—approximately 20 percent of all Harvard undergraduates. Ben-Shahar obtained his B.A. and Ph.D. from Harvard, and for the last 15 years has been teaching leadership, happiness, and mindfulness to audiences all over the world. He is the Co-founder of the Happiness Studies Academy and author of six books, including the international bestsellers Happier and Being Happy, which have been translated into more than twenty-five languages. For more information, visit talbenshahar.com. 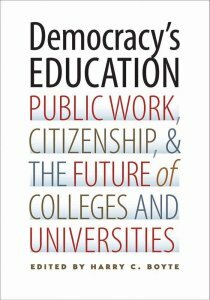 During the third hour I’ll be replaying a rebroadcast of a 2015 interview with Dr. Harry C. Boyte, Senior Scholar in Public Work Philosophy at the Sabo Center for Democracy and Citizenship at Augsburg College, regarding Democracy’s Education: Public Work, Citizenship, and the Future of Colleges and Universities. Today, Americans feel powerless in the face of problems on every front. Such feelings are acute in higher education, where educators are experiencing an avalanche of changes such as cost cutting, new technologies, and demands that higher education be narrowly geared to the needs of today’s workplace. College graduates face mounting debt and uncertain job prospects, and worry about a coarsening of the mass culture and the erosion of authentic human relationships. Higher education is increasingly seen, and often portrays itself, as a ticket to individual success–a private good, not a public one. Harry Boyte will delve into the idea that Americans feel powerless to address the mounting problems that face this country, while advising educators to claim and use their sometimes unappreciated power in the face of these problems. He challenges them to lead a movement in the rethinking of education, the meaning of citizenship, the state of the working world in today’s society, and the challenge of addressing public issues. Boyte believes education is “the anchoring institution of citizenship,” which shapes public identities and career paths of students and influences the methods and structures of many professions. Boyte coordinated an association, called the American Commonwealth Partnership, of several hundred colleges and universities, to strengthn higher education as a public good. Harry C. Boyte is Senior Scholar in Public Work Philosophy at the Sabo Center for Democracy and Citizenship at Augsburg College, a Senior Fellow at the University of Minnesota’s Humphrey School of Public Affairs, and Visiting Professor at Nelson Mandela Metropolitan University in South Africa. He is the author of eight previous books, and his work has appeared in more than 150 publications including Huffington Post, New York Times, Chronicle of Higher Education, Political Theory, and Change. His commentary has appeared on CBS This Morning, CBS Evening News, and National Public Radio.